We've all had that feeling, haven't we - stop the world, I want to get off! For me, these few days between Christmas and New Year are just that. It doesn't exactly stop, but it slows down - not as much as it used to before emails and internet - but enough to let you catch your breath, reflect on the holiday just gone and plan for the year to come. Last night was a perfect example of that for me. My husband had a friend over so that they could sample each others' Christmas whiskies so big daughter and I took the opportunity to watch a girls' film together (as opposed to a boys' film which usually involves aliens, espionage, shooting and lots of fast-paced, edge-of-the-seat action). We watched Sliding Doors, a film I remember going to the pictures to see when it came out (in 1998, doesn't time fly!) and knew that big daughter would really enjoy. 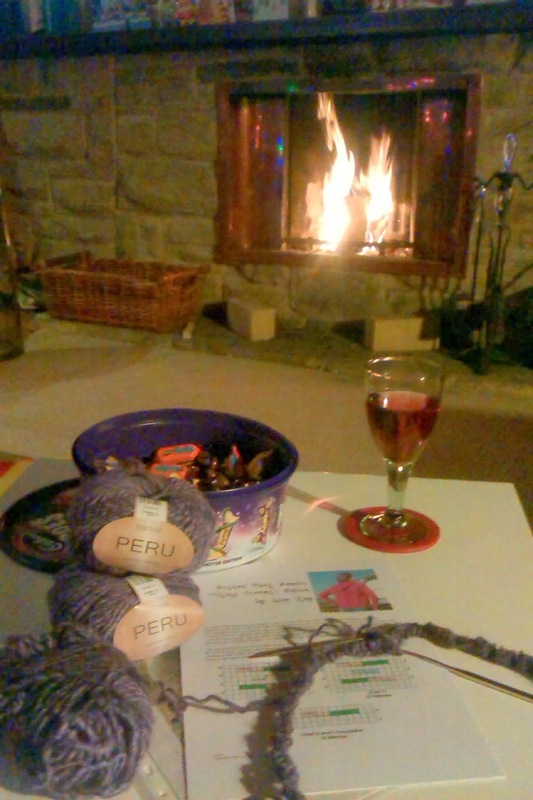 A glass of wine, a roaring fire, a box of chocolates, a good film and a daughter to share it with - perfect! Oh, and something woolly, of course! Last night was a good opportunity get the knitting needles out to start on a new project. Yes, yes, I know I'm half-way through a pair of socks and my Vivid sock yarn blanket will never get finished if I keep starting something new, but there's just something about choosing a pattern, finding the right needles, breaking open the band on a brand new ball of yarn (not something I always do but necessary with this yarn) and settling down to cast on that really fits with this time of year. 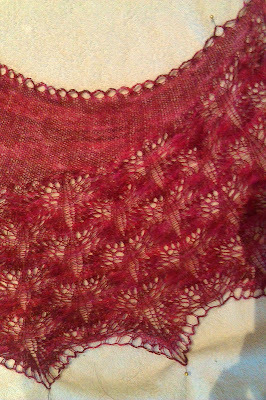 I bought the yarn, luscious Sirdar Peru, chunky and soft with alpaca, a few years ago to make my sister in law a cowl for Christmas. 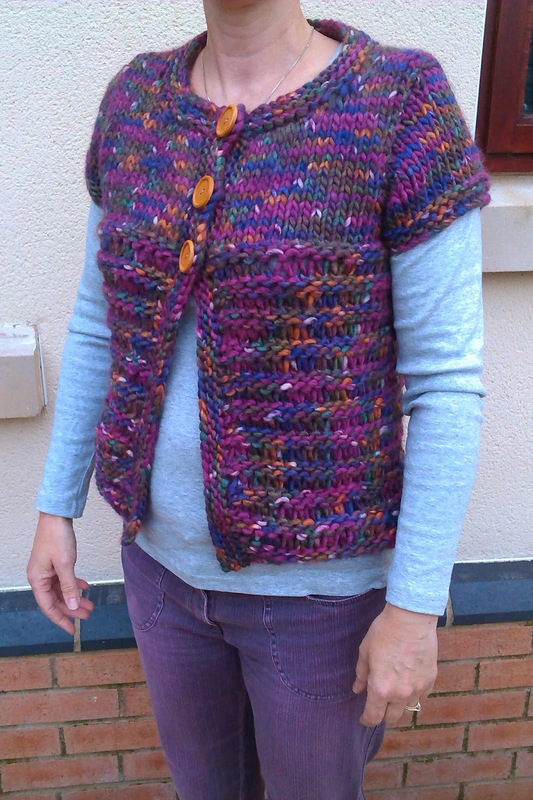 She loved it and after knitting with the yarn, I knew that I had to make something for myself so bought more yarn to make a jacket - and I'm glad I did as it's been discontinued now. I'd made a Central Park Hoodie jacket that same year and then found a version with Viking cables so that was what I had in mind. It's just taken me until now to cast on. 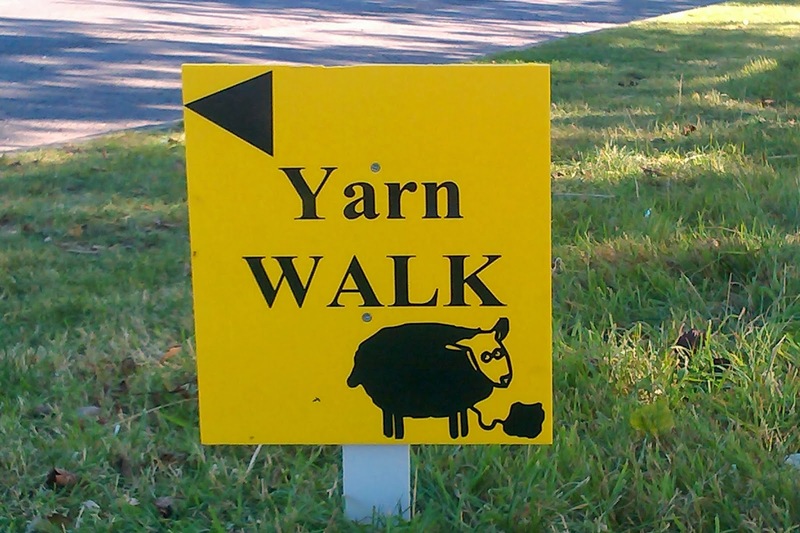 Yarn, I have discovered, has a definite pattern and time frame for itself in mind and whilst that might sound crazy, ask any knitter (or crocheter) and they'll agree with me completely. So now it's time for the alpaca yarn to become a jacket and it seems to be very happy with the idea. Christmas was just lovely for us this year, and I hope yours was too. We take it in turns with other members of our family to host Christmas Day and this year it was our turn. Christmas dinner was a noisy, friendly, happy affair. Our timings were just right, our rather temperamental Aga behaved perfectly and even remembering that I hadn't decorated the Christmas cake in time wasn't the disaster it might have been. Big daughter and my brother took over decorating duties and our cake ended up looking like no other Christmas cake - we had candles, writing icing (including a few unfortunate orange splodges that looked like baked beans - not your usual Christmas cake decoration! ), gold and silver nuggets, a jolly snowman and a moose that came IKEA many years ago - and big daughter laughed and laughed and loved every moment of creating a fun memory with her uncle. 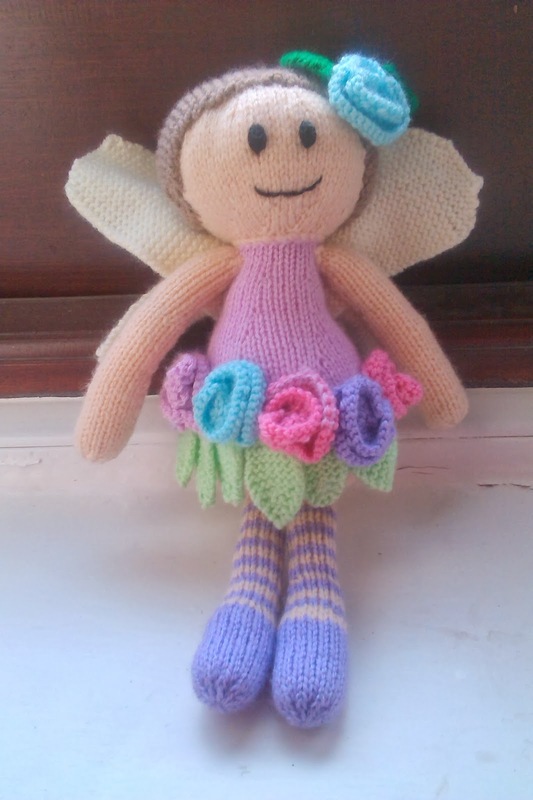 Small daughter, to my delight, spent the day keeping tight hold of the knitted fairy that I'd made her for Christmas. She'd seen the pattern some time ago and asked if I would make her one (sometimes I think she imagines that I can whisk these things up overnight and it would be lovely if I could) so I thought that it would make an ideal present. I wrote down detailed instructions about exactly which colours to use if I ever got round to knitting it and then set to work whilst small daughter was in bed. 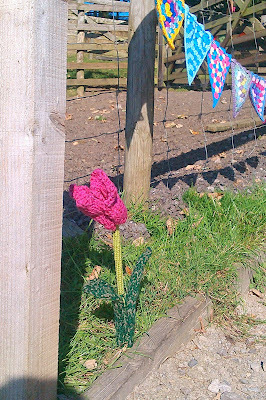 I used to make quite a lot of knitted toys and had forgotten quite how fiddly they can be. 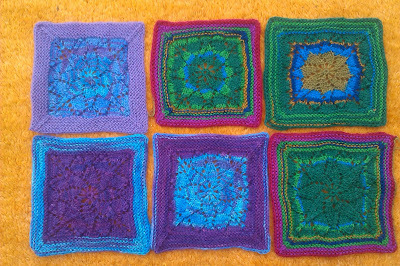 Not only the knitting - cast on 7 stitches, increase here, decrease there, cast off - but the sewing together can take as long as the knitting itself. Here she is, and I'm very very pleased with how she turned out. I wasn't sure about the mix of colours when I was writing down my instructions, but now that she's finished, I think small daughter made good choices. I'm not always very good at faces but after several attempts this one was just the right kind of smiley. I still don't think she has a name but she's still appearing all over the house wherever small daughter is and has a special place in her bed at night. I think it's fantastic that although small daughter is growing up so quickly, she still wants toys like this and I know this fairy is going to be very loved which makes all the effort worthwhile. In a few days' time it will be New Year. These days before it always feel a bit like the climb on a roller coaster before launching off into the New Year - hurtling, laughing, a little bit tense and breathless, and so many emotions that will come into play as the year unfolds. It's like sand on a beach when the waves have washed it clean and flat. There's always the chance to start something new, to create something good, to repair what's gone before. I like the infinite possibilities of it all. I'm in a different place emotionally this year as I'm ready to face 2014. I spent five days before Christmas at a meditation retreat run by Art of Living (which I've mentioned before) at the very beautiful Florence House in Seaford just outside Brighton. Yes, it is a long way from Winwick and especially a few days before Christmas, but it was absolutely the right thing to do. I was all organised thanks to my Flylady routines and my husband had finished work for Christmas and was able to look after the girls and take care of the last few Christmas things that we needed to do. It was actually his idea that I went, which just goes to show what a wonderful man he is! All I had to do was enjoy myself - which I did, immensely - even the two and half days of complete silence that were part of the course. 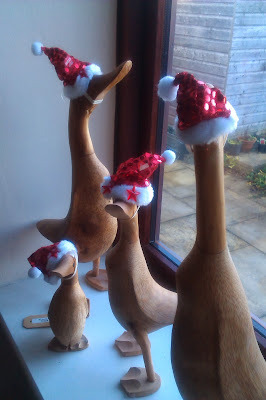 I'll have more to tell you about it in future posts, but what the retreat has brought me is a sense of joy, of peace, of calmness in the Christmas madness, and a sense of purpose for next year. I'm even contemplating starting my own business which will take time, money, effort and more than a little courage, but I'm in a good place now to get my research done and see if it's something that will work for our family. When you tell people you meditate, many of them roll their eyes and assume that you're a bit mad - you may be one of them, and I certainly didn't see the point of it before I started - too slow, too boring, I have too much to do! - but now that I see what it's brought to my life, I think it's something that everyone should do. Closing your eyes for even a few minutes to concentrate on your breathing is enough, and helps us face the day - and the New Year to come, whatever it might bring. I wish you every happiness for 2014. 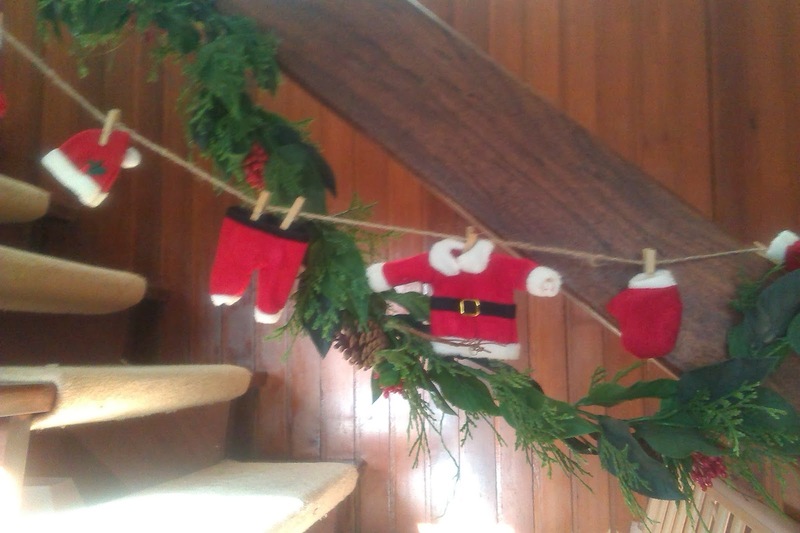 Our decorations have been up for ten days now and I still feel a thrill of delight every time I come downstairs in the morning and see them. We always used to put our decorations up just before Christmas, but last year we decided that we'd put them up earlier and we loved it so much that we've done the same thing this year. It still has to be December - November is just a little too early for us - but the very beginning of December means that we get to enjoy them for longer. So, indulge me whilst I take you on a tour of our Christmas festiveness - I love our Christmas house so much that I can't resist showing it to you! We'll start at the front door where our home-made wreath hangs. I had wanted to make my own wreath for a few years instead of just renovating a shop-bought one, so a couple of years ago I finally decided to give it a go. The base is made from some bendy branches of forsythia which I simply wrapped into a circle and secured with some wire. 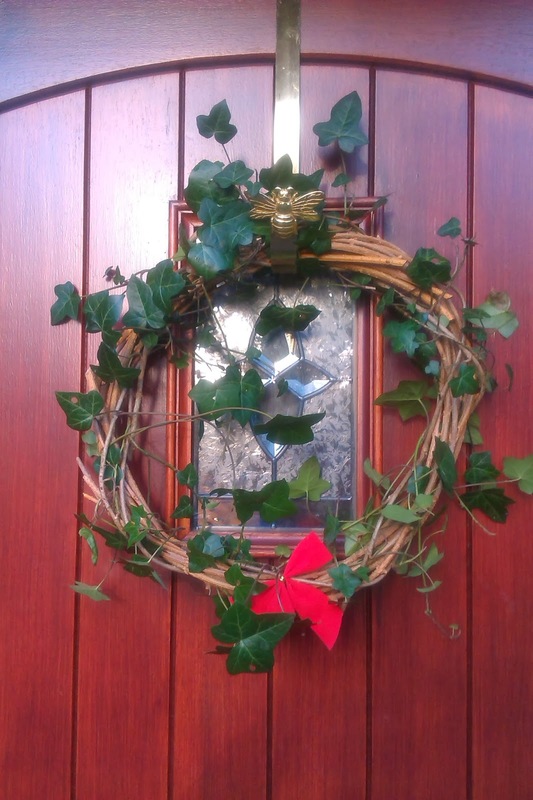 The ivy comes from the bottom of the garden and voila, that's it done. Some people might think there's not much to it, but I like the simplicity of it and the fact that I can keep the base and replace the ivy every year with whatever I want. Come on in, I'll show you some more. This is an indoor wreath that I made last year. 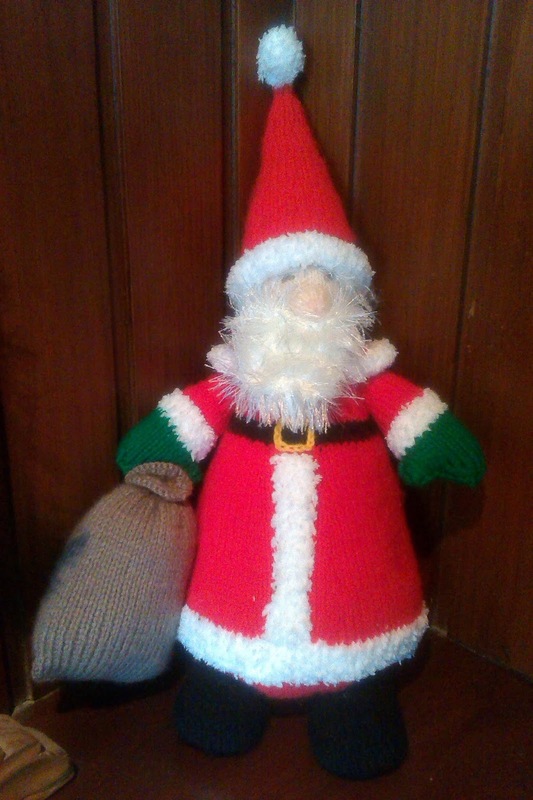 I bought the base but knitted the Santa, holly and gingerbread man from Simply Knitting patterns. 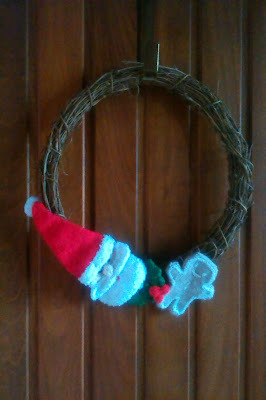 I love the crocheted 'more is more' wreaths on Lucy's Attic 24 blog, but I wanted to keep this one simple just like the one on the front door. Small daughter has to stroke Santa's beard every time she walks past, and it's so soft and fluffy it's not hard to see why. I chose the gingerbread man to go with him because both my girls love gingerbread men and that's a good enough reason for me. 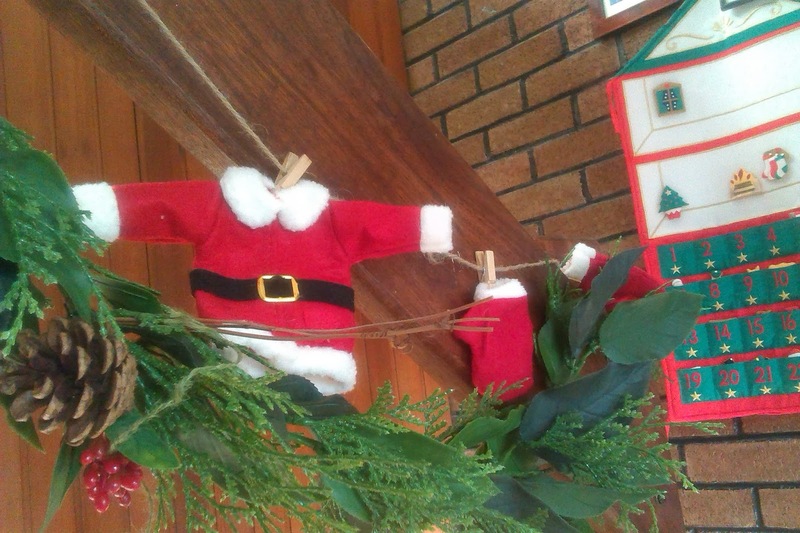 This is our bannister garland. When I bought it, I had hoped that it would be big enough to wrap right round the bannister, but it doesn't so I'm starting to think that I need to make one that does what I want it to do. We've had this one for about ten years now and whilst it's not quite ready to go into retirement, it could probably do with a bit of help. I love the tiny clothes on the washing line which I bought last year - I couldn't resist! Here's another knitted decoration - Father Christmas! Small daughter has been asking me when I'm going to make Rudolph to go with him and I know that I probably should (the yarn is sitting in my stash, waiting) but knitted toys aren't my favourite thing to do. I'm quite happy to do the knitting but the sewing up is so time-consuming and of course I always leave knitting Christmas decorations until far too late in the year (there's something odd about knitting for Christmas in the summer, I think) so it becomes more of a chore than I want it to be. So, for the time being, Father Christmas sits by himself but I don't think he really minds. Big daughter saw these little hats when we were in Liverpool one year and insisted that we bought them for our family of wooden ducks. I'm sure they enjoy being part of the festivities! We've been lucky enough to be able to take the girls to Lapland to meet Father Christmas. It's such a special moment when you watch your child meet him, one of those catch-your-breath-brings-tears-to-your-eyes moments that you know they (and you) will never forget. Small daughter was quite overwhelmed and for the first time in her life was completely speechless, although she had plenty to say about it all afterwards! If you ever get the chance to go to Lapland, then go. It's so beautiful, so quiet, so snowy and if you're really really lucky you get to see the Northern Lights. 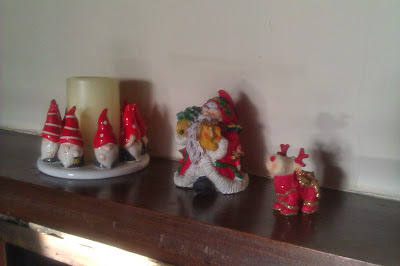 These decorations are our reminders of the fabulous time that we had, and it's always a joy to bring them out of their wrappings to put on the mantelpiece. We have so many decorations that are just part of our family tradition, and you don't need to see them all. This one, though, is one of my favourites and I hope you won't mind looking at just one more. 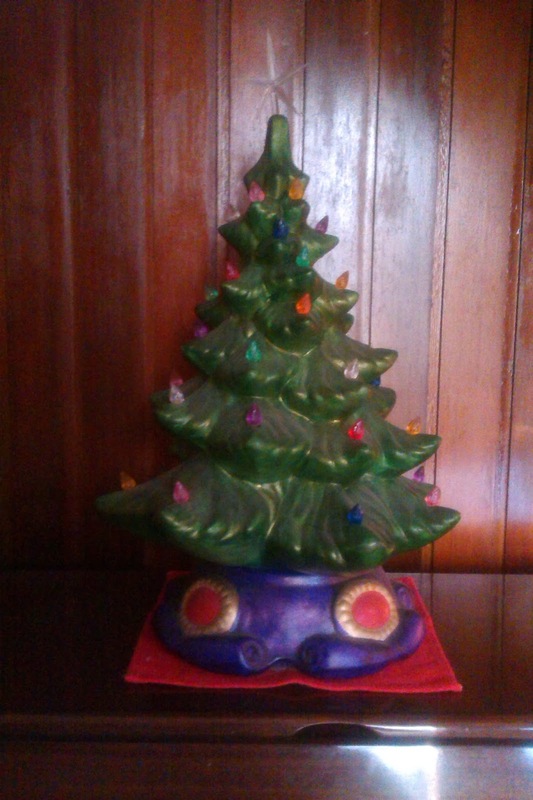 My Mum painted this tree for me; it has a bulb inside and little lights at the ends of the branches so when it's lit it looks beautiful. 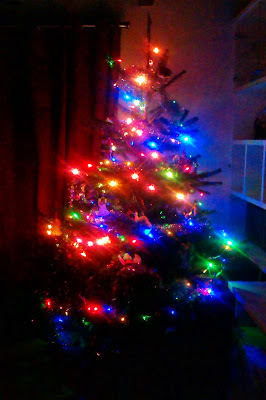 Because my Mum's not here any more, being able to put the tree out makes me feel a bit closer to her at Christmas time. All of our decorations have memories; we've collected them over the years - some are from when I was small, we've even got one or two that are from when my Mum was small, some were made by the girls, some have been made by me, some have come from special holidays - they're moments in our family history and bringing them out each year is like greeting old friends. I think that the year flies past so quickly that it's nice to be able to take the time to enjoy the run up to Christmas. I'm hoping to have everything done by the end of the this week so that I can sit back and relax rather than chase about like a mad thing. I've done the wrapping presents on Christmas Eve thing and it's not fun. For the last two years I've been following Flylady's Cruising Through the Holidays plan and it's made a huge difference to how calm the days before Christmas are - I'd recommend it to anyone! It means that I've got time to spend baking Christmas biscuits with the girls, building and decorating our IKEA gingerbread house kit (always a fun morning!) and for one of our very favourite traditions - going to see The Polar Express at a 3D showing on Christmas Eve. It's a magical film - readily available now on video or to read as the original story book - about a little boy who isn't sure whether he believes in Christmas or not. We've seen it so many times now but every year is a treat and part of the Christmas magic - we wouldn't dream of missing it! I have every intention of writing more before Christmas but I know that the way that time disappears like sand running through your fingers will probably mean that it's January before I actually manage to - so I'd like to wish you all a very Merry Christmas and a Happy New Year just in case I don't get chance to later. The other week I had one of those weeks where if it was going to go wrong, it went wrong. I couldn’t wait for the week to be over, and said so today during a phone conversation with one of my best friends. “Why didn’t you call me?” she asked. She lives a long way away so wouldn’t have been able to offer much in the way of practical help, but as she pointed out, I could have talked to her and that might have made me feel better. “It might have helped you regain some perspective and seen that it wasn’t such a bad week after all,” she said, and she’s absolutely right. There were many reasons why I didn’t phone her that week, but I think the biggest one was that I thought I had to sort things out on my own. Our conversation made me realise that I’m not always very good at asking for help when things are going wrong. I feel that I should be capable and in control and able to fix the problem for myself - but sometimes this just isn’t possible. Sometimes, you need somebody else to help and what I learnt today during that phone call is that people are often delighted to be asked for help. Struggling on denies somebody else the pleasure of doing a good turn, and Christmas is one time in the year when the stress of planning the holidays could be alleviated by either doing a good turn yourself or allowing someone else to do one for you. There are so many little jobs that could make someone’s day that bit easier if they were taken off their hands; trips to the Post Office or even just the post box, helping to put up decorations or taking in parcels when a neighbour is out to save a long trip to the sorting office. I wouldn’t hesitate to help someone out if they asked me and I bet you wouldn’t either, but I also imagine that like me, you’re not brilliant at asking for help for yourself. 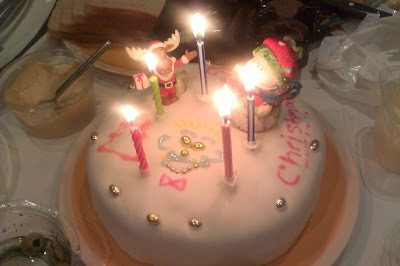 Not a great one for keeping New Year’s resolutions, I’m going to suggest that we should have a Christmas one instead. I think we should resolve to ask for help if we need it, to allow other people to share their expertise and generosity in our lives, and to be aware that others are just like us and will struggle on before finally “admitting defeat” and asking for assistance. Acknowledging that you can’t do something on your own is not an admission of defeat. It allows others to share in what we are doing and often that makes the whole experience more enjoyable. They can see that that we’re not perfect, not always in control and capable and instead of turning them away, it draws them closer. You are giving them the gift of being able to give something to you, and that’s what I think Christmas spirit is all about. 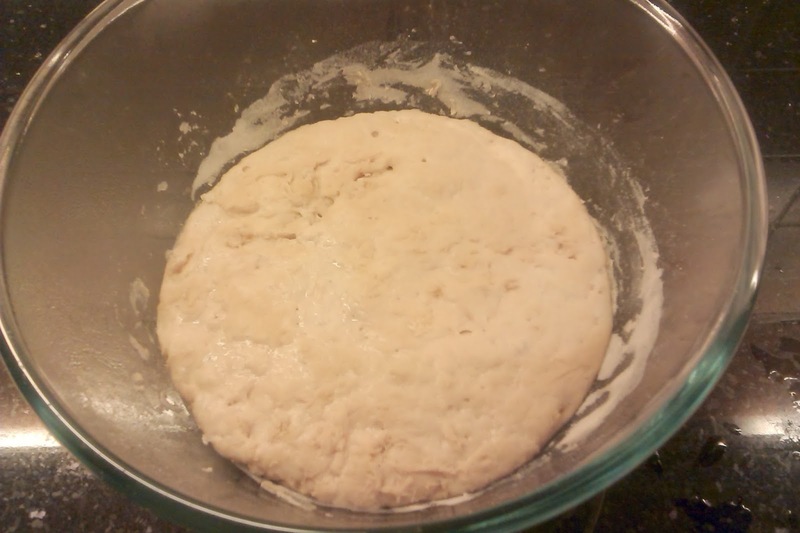 About a year ago, my husband discovered sourdough bread and loved it so much he no longer wants to eat any other type of bread. He doesn't eat much bread anyway, so it was no big deal to pick up a loaf for him when I was out and about - as long as it was on the shelf. I have a few places that I can buy from, but just recently I've not been able to get a loaf from any of them. 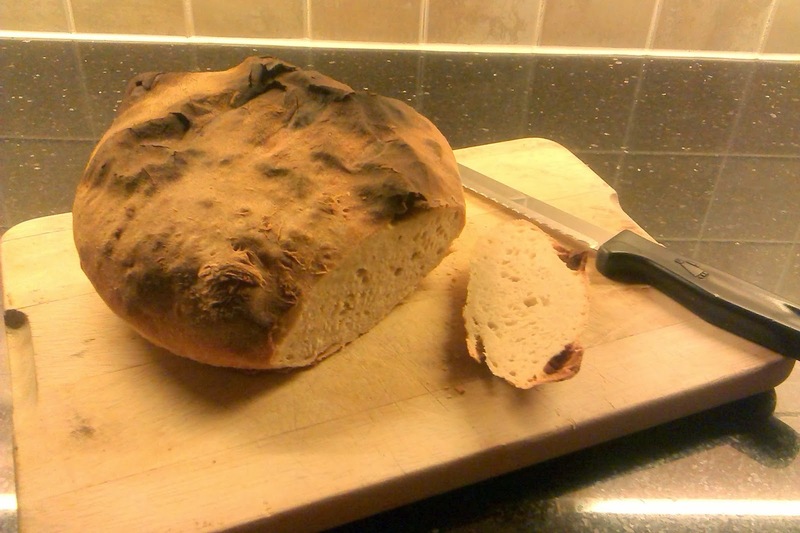 Whether it's because the bread is more popular or the stores just don't bake that many of them, I don't know, but it's finally prompted me to have a go at making my own. I've avoided it up until now because I know that it's not your average loaf of bread. I knew that it took a few days to make the starter before you even get to making the loaf, and it seemed like too much hassle. However, after a few days of fruitlessly trying to buy a loaf, I decided enough was enough. 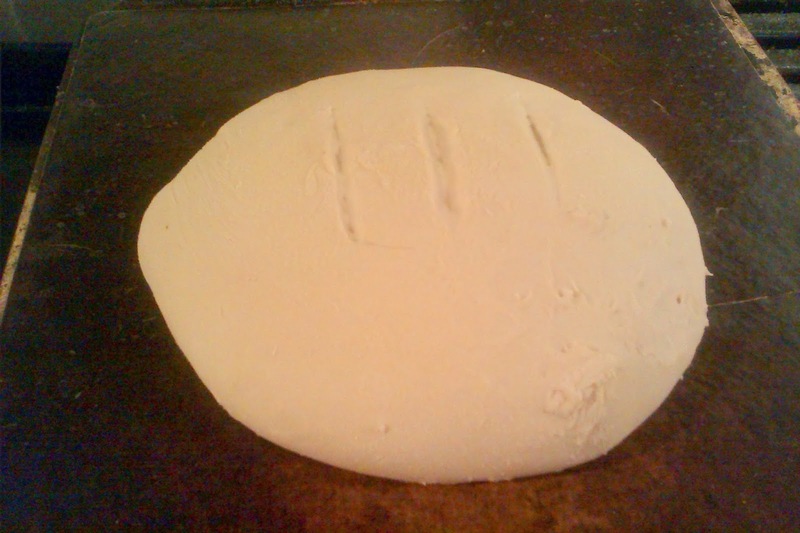 It was time to make some sourdough of my own. 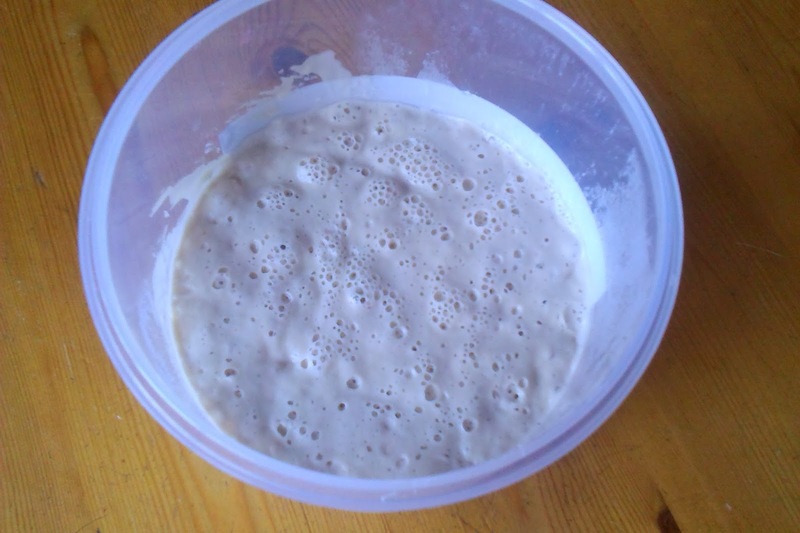 One of my best friends has also started some sourdough recently and it exploded in her airing cupboard which didn't bode well for my attempts as she is an excellent cook and if anyone can make this bread then she can. However, it seemed I had little choice as the bread bin remained empty and my husband was starting to grumble about the apparent national shortage of sourdough bread. Unlike other methods of creating the starter, my recipe doesn't use grapes or any added ingredients other than flour and water, and it's stored in a plastic container not a glass one as sourdough leaven has a tendency to explode (hence my friend's messy airing cupboard). It does take four days, but to be honest, it was surprisingly little effort. 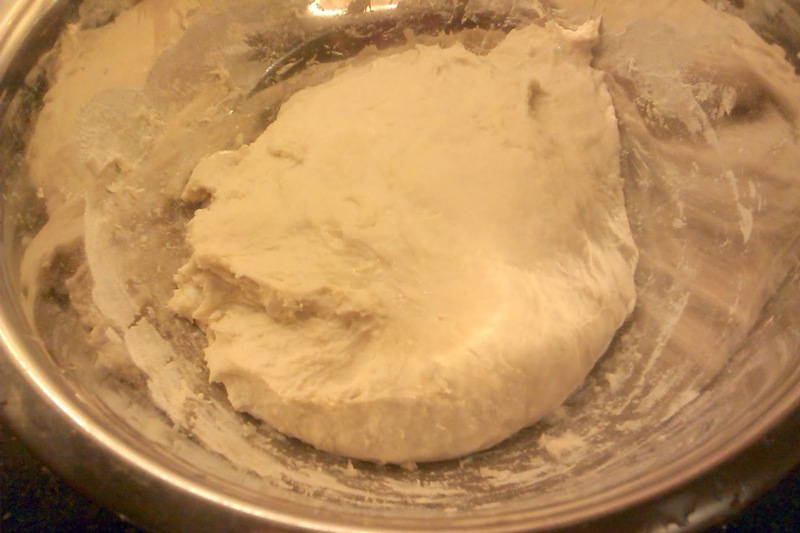 All I had to do was add some flour and water to the pot, mix it together and keep it warm. 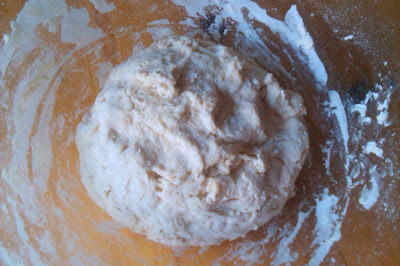 ... and waited ... and finally it was ready to go into the oven! Here's my finished loaf, toasted on the top just as my husband likes it. It does smell different to normal bread but it tastes fantastic so I'm happy that all the waiting was worth it. My husband thinks so too - but I still might buy the loaves when I see them in the store! On Saturday afternoon - joy of joys! - I was able to collect my sewing machine from Maeri at The Make and Do Studio where it had been to be mended. 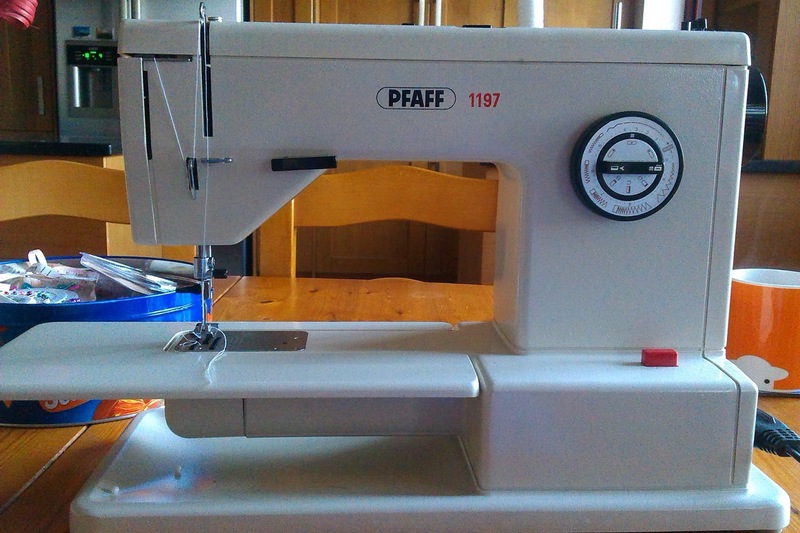 The problem was that a gear had split and I was originally told when I took it to a repair shop that it was beyond fixing, but whilst chatting to Maeri, she suggested that I let her sewing machine repair engineer colleague take a look at it just in case there was anything he could do. I was already resigned to having to ask for a new one as a Christmas present but it seemed like a good idea anyway. Just in case. So imagine my delight (and considerable surprise!) when Bob said that it wasn't beyond help after all. It's 30 years old at least, my machine; it was my Mum's and was an expensive one when she bought it so I'd be unlikely to be able to replace it like-for-like - but most of all I'm so pleased that I can carry on using my Mum's machine. I like the continuity. I like looking at the cotton reels in the storage case and remembering what she made with the colours. I like to look at the attachments and remember picking them up and examining them as a small girl whilst she sewed at the kitchen table. I like the idea that my girls will be able to use it and it's a machine with a history. 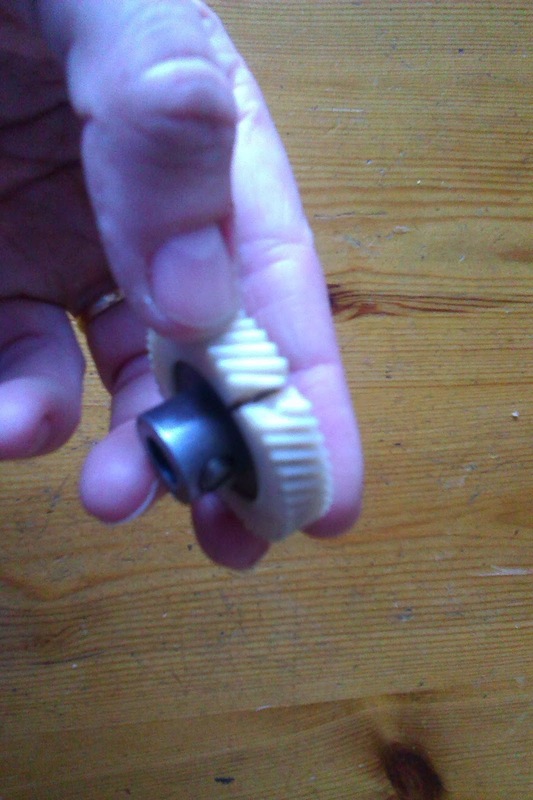 This is the split gear wheel - it's much smaller than I imagined it to be, but you can see why the machine was a bit poorly! 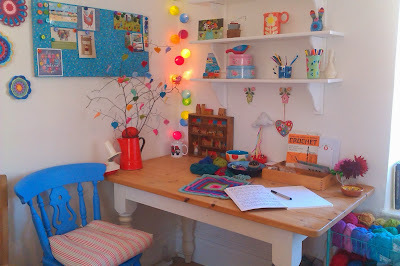 And here's my machine, back on the kitchen table and ready to go! 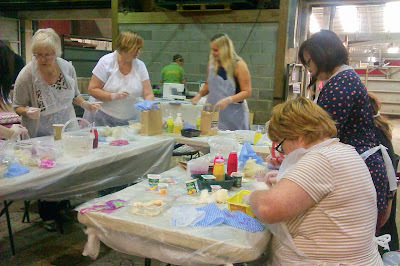 I signed up for an online sewing course a few weeks ago through an Australian store called The Haby Goddess. It's a nifty idea - it runs for six weeks with a catch-up week in the middle and a few extra catch-up weeks at the end. Each week's lessons are uploaded on a Monday morning and then you have the week to work through them at your own pace. There are also project sheets to practice what you've learnt, a Facebook page to show off pictures and ask questions and plenty of opportunity to contact Jodie, who runs the course, to make sure you're doing it right. I decided it would be a good idea because my dressmaking skills are a bit rusty and I want to work on them with big daughter. This course is ideal for us as it starts right at the beginning so big daughter can gain confidence without having to learn how to put zips in, for example, in the middle of a project. I'm quite a way behind as I've been waiting for my sewing machine to be repaired, but when I got it back on Saturday I was far too impatient to start at the beginning and instead launched into a project - a bean bag bed for my friend's pup! This is the bean bag bit, completed without too many beans on the floor. They're really fiddly to pick up if you spill them as they go static-y and stick to the brush and fly about the room, so it's definitely a job that needs your full attention! Next onto the cover. 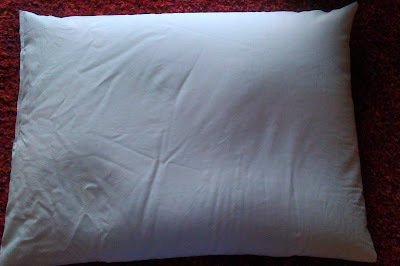 I made a bean bag for our dog a while ago as I didn't like the way his bed had gone lumpy, so it was a simple matter of taking the lumpy filling out and replacing with beans (which is why I know all about them flying all over the place!). It's so much easier having washable covers as dogs are such muddy things, especially at this time of year! I decided to put one of the Sew School lessons into practice and made a zipped cover. 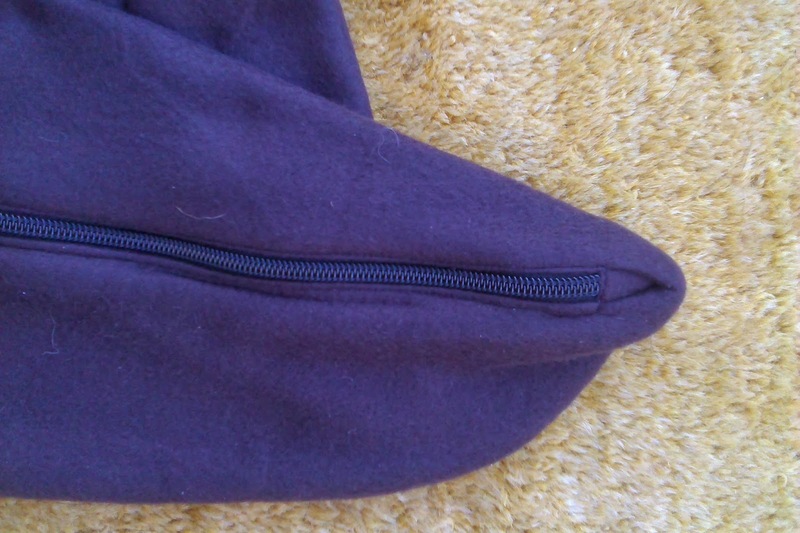 I'm really proud of the way that the end tab covers the end of the zip and looks very professional! And this is the finished article! 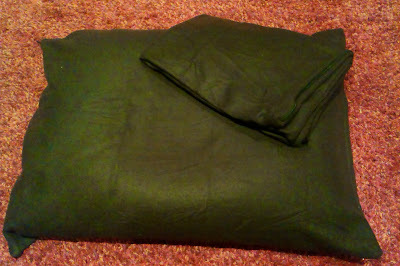 I made two covers so that one could be in the wash, and I'm very pleased with it. 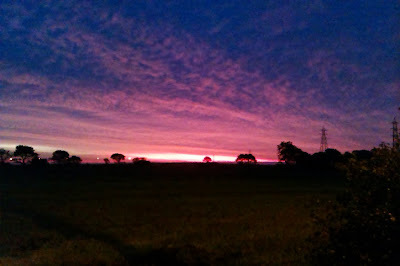 As usual, the colours have done strange things in my photos - I need to work on my photography! - but they're actually quite a nice chocolate brown colour which is an excellent colour for muddy dogs! Not bad for a start, and I'm going to enjoy going back over the lessons and getting to know my sewing machine again. Big daughter is also looking forward to making something else after her first foray into dressmaking this summer, so hopefully we'll have more to show you very soon! It's always strange after the girls have gone back to school. Our October half-term was a week earlier than lots of schools so we haven't been able to catch up with friends in different parts of the country this time, but we still had plenty of things to do. Now that I've got the house to myself again, I'm back on my de-cluttering mission. 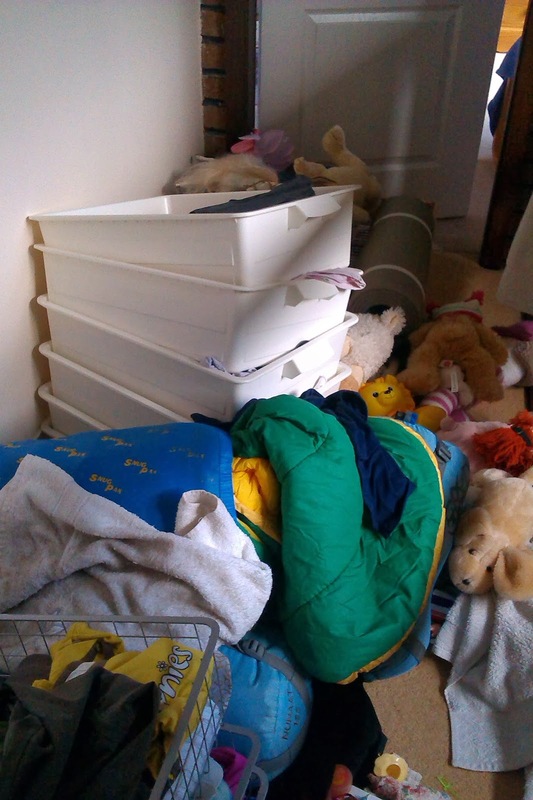 We made a big dent in that with the Great Bed Swap which in turn led to the Great Bedroom Clearout, the aftermath of which is still on the landing in bin bags waiting to go downstairs to the dustbin. We're mostly done now; big daughter prefers to sort her things out for herself but small daughter needs to be supervised otherwise she filters out the mess and can't see anything but a tidy bedroom. I think we've all got that ability, but unfortunately, it's not practical to use it most of the time! Part of my de-cluttering involves finishing things off. I've got so many ideas buzzing around my head all the time that it's all too easy for me to get distracted but I've made a concerted effort to tick a few things off my list this week. First up, the garden pots that I wanted to put up to brighten up a boring wall. 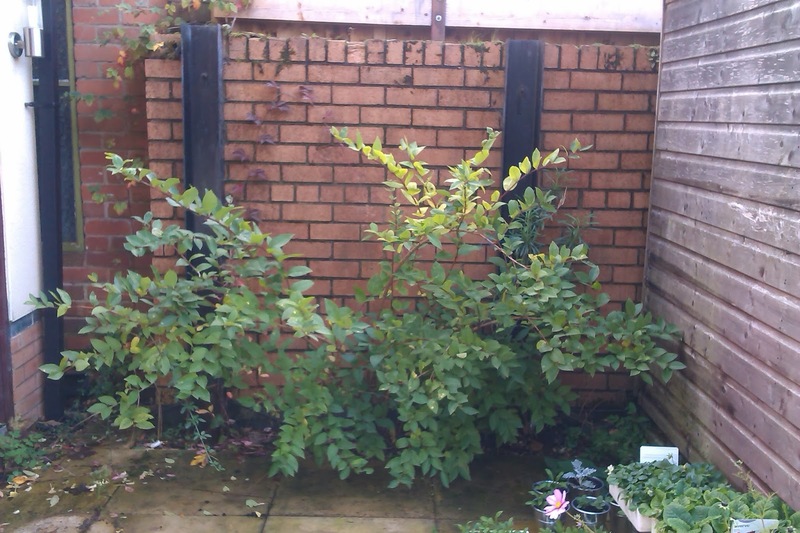 The sprawly bush is some kind of honeysuckle but it's never done anything exciting so it had to go. It's quite a dark, damp place and nothing has really thrived there - apart from this plant which has had it's moment. The pots I wanted to put up involved drilling holes in the wall so I handed the drill over to my Dad who'd come over for the afternoon. He can do that sort of thing much faster than I can, and would only supervise anyway, so it's easier all round to leave him to it. This is the result, and I'm very pleased with it. The plants, winter bedding plants, are plug plants that are still filling out, so they look a bit piddly at the moment but will soon be much bigger and the pots won't look quite so lost on the wall. They're actually IKEA kitchen utensil holders but as soon as I saw them, I knew they'd be ideal for my wall. The pots even have handy drainage holes already drilled into the bottom of them - perfect! Next on the list, I finally found some buttons for the Sirdar Kiko cardigan that I made with the yarn that I bought from the Black Sheep open evening. I finished the cardigan ages ago, it was such a quick knit with huge yarn on even huger needles, and I've worn it a couple of times. It took me a while to find the buttons that I wanted and eventually I found them at a local garden centre, of all places. This elegant dishcloth is in fact my Bayfield shawl which I wrote about here in July. This is a close-up of it as it was blocking - the pattern is just beautiful and I'm so pleased with it. It's interesting to see how the colour has changed depending on where it's been photographed too - I'd always assumed it was shades of red and pink but the outside picture looks much more pink. I'm very much looking forward to wearing it! But as pleased as I am with all of these, I saved the best till last. Fanfare please ... I have finally found a pattern to make a sock yarn blanket! I've made a LOT of socks - over 40 pairs at last count - and they don't use up a whole ball of yarn, so I've been wondering what to do with the rest of it. 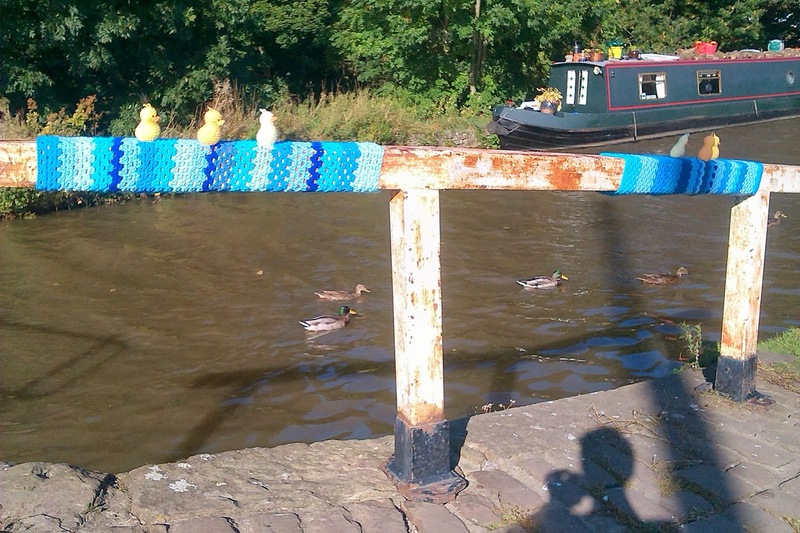 I've looked at various sock yarn blankets on Ravelry but nothing's really caught my fancy. Until I came across this pattern. 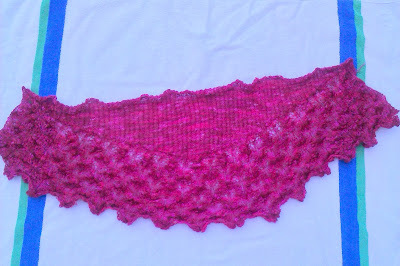 It's called Vivid by Tin Can Knits and it's just perfect for what I want to do with my yarn. As I looked through my leftovers, I realised that I have a bit of an addiction to stripy socks and I wanted a pattern that would make the most of that without breaking up the stripes too much. You can see from the next picture that the stripes come out beautifully with this pattern, and it's fascinating to see how different the squares are even from the same ball of yarn. It's going to take me quite some time to have enough for a blanket, but there's no rush. I've loved all the socks that I've made; most of them have been for other people so I like the idea of being able to keep the memory of that sock in a blanket square. It'll be my Socks I Have Known blanket J. But despite all my good intentions, look what arrived in the post today! It's a Stylecraft colour pack which I bought from Wool Warehouse - excellent price and service - and is for a new project that I'll be able to tell you about later. What did I say about being easily distracted ...? Small daughter always has a lot to say for herself but because of the hours my husband works, he doesn’t often get chance to catch up with her before she goes to bed. Today, though, he was getting the full story and what made this even better was that he was in America. I can often be heard to do quite a lot of muttering about new technology, usually when I’m at the self-service till at the checkout (“it’s IN the bagging area!”), but even I can’t deny that being able to see and speak to your family when you’re thousands of miles away and five hours behind is nothing short of amazing. Small daughter takes all this in her stride. To her, it’s nothing miraculous at all, it’s just how it is. She navigates around the computer with ease, knows how to work my mobile phone better than I do and wouldn’t dream of going on a long car journey without her iPod. Big daughter can’t believe that there was once a time when we didn’t all have mobile phones. Trying to talk to her in her room the other day, her phone bleeped almost constantly with message after message for the five minutes I was in there. If I wanted to ask a friend about my homework, I had to go round to see them, or wait until the next day. I certainly wasn’t allowed to use the phone for such a trivial matter, and if I did manage to persuade my parents that a phone call was vital, I had to wait until after six o’clock when it was cheaper! Most of the time, I wouldn’t be without the technology that we have now. Big daughter went on a Duke of Edinburgh Award expedition hike last weekend and we were more than relieved when the original “no mobiles” instruction was changed to “take them but don’t use them”. At least I knew that in an emergency she could call for help, and when her return train was late home, I knew exactly what time to meet her at the station. And when our electricity went off overnight a few weeks ago, I realised that although there is something rather nice about sitting in a room lit with candles with nothing to do but talk to each other, I was also very glad when the electricity came back on as I’m lost these days without the internet! So much of the technology around today makes our lives go faster; we immediately reply to emails or messages rather relying on the post, or we just call someone up to ask a question instead of waiting until we next see them which can be as frustrating as it’s useful, but watching their smiles as my girls spoke to their Dad so far away, I wouldn’t swap any of it. My daughters have decided to swap beds. Not rooms, just the beds. It also seemed like an ideal opportunity to go through the stuff that they both have in their rooms that somehow seems to accumulate without you really noticing. It seemed like such a good idea at the time but now, most of small daughter's stuff is on the landing whilst we made some space to get around. There is a reason for all of this. Big daughter has had a 'high up' bed with a ladder for the last nine years or so and now wants a normal 'low down' bed. Small daughter has been desperate for a 'high up' bed for some time and was more than happy to swap her 'low down' bed for big sister's 'high up' one. Small daughter's bed was the easy part. Big daughter's bed came from IKEA and wouldn't go through the door without dismantling. Cue lots of muttering, flying allen keys and bolts that we were in danger of losing until big daughter produced a storage pot from somewhere in the bathroom that saved us having to go downstairs to root one out. My husband is at work, of course, and this seemed like one of those things that we could easily do over the last days of the school holidays (taking apart and re-building IKEA furniture is not his favourite pastime so we have saved ourselves from more muttering) - even though I knew that it would take longer and involve more mess than I hoped. The beds are up in their new places now, the bedding is ready to go on and we are returning to something like normal. Big daughter is busy rearranging the rest of her bedroom furniture as teenagers are wont to do. Small daughter has sneaked off to watch TV. Her stuff is still all over the landing and I can't get into my bedroom until it's moved. It's going to be a long afternoon. It's been a busy couple of weeks but they've been good ones. First off, my Dad and my brother both have birthdays in October so we have an annual family meet-up to celebrate both of them at the same time. 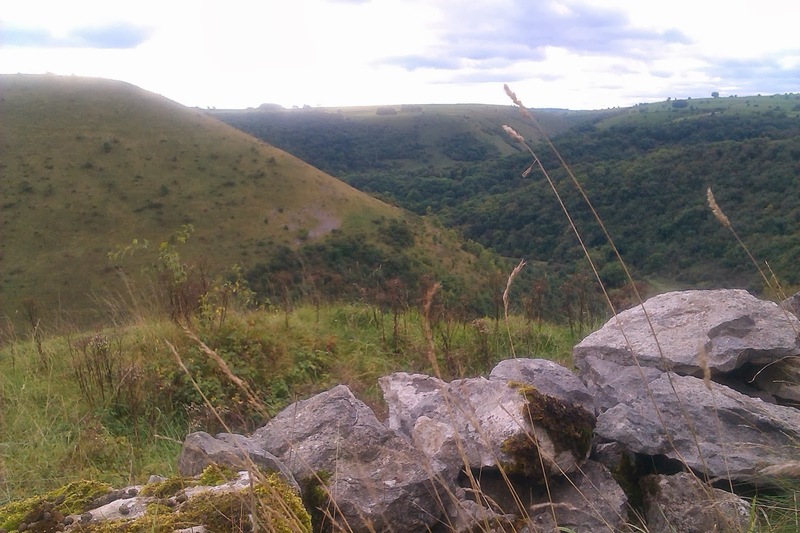 We've done various things together over the years, and this year we decided to make the most of a glorious Autumn weekend and head to Derbyshire for a walk in the hills. As you can imagine, the dog was the first one to be ready, keen to get out and about with all those new smells! We went to Monsal Dale in the Peak District National Park, somewhere new to us all. My brother and his wife are seasoned walkers who, along with my Dad, will think nothing of a ten or twelve mile walk in a day. However, we've got people with much shorter legs to think about, and whilst the dog would have cheerfully tackled a twelve mile walk, small daughter wouldn't. 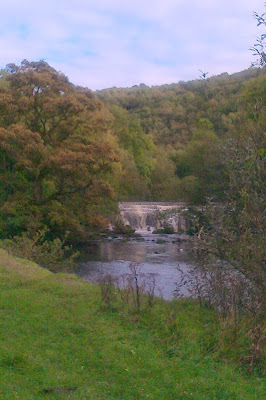 So we used our book Derbyshire Walks with Children and found a much more suitable four mile walk instead. 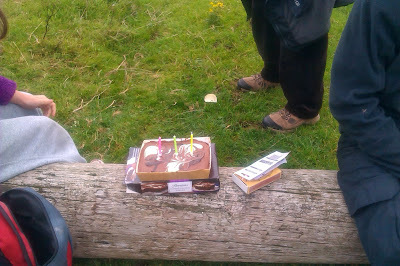 ... but unfortunately we forgot to pack a knife so we just pulled chunks off the cake and ate it in a very unsophisticated manner - and it tasted wonderful! There's something about food eaten outdoors anyway, but sharing our picnics and the birthday cake made it all taste extra-special. 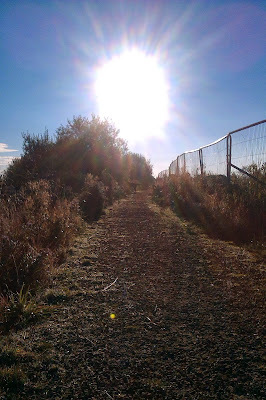 We continued on our walk. Small daughter insisted on walking at the front, waving the stick that she had found and singing to herself as she marched ahead. Then came my Dad, my brother and his wife and big daughter, with my husband and me bringing up the rear with the dog (who needed to stay on his lead because of livestock, much to his disgust). It was lovely to watch the different generations of the family together, and all the more so because we don't often get chance to spend much time together during the year. 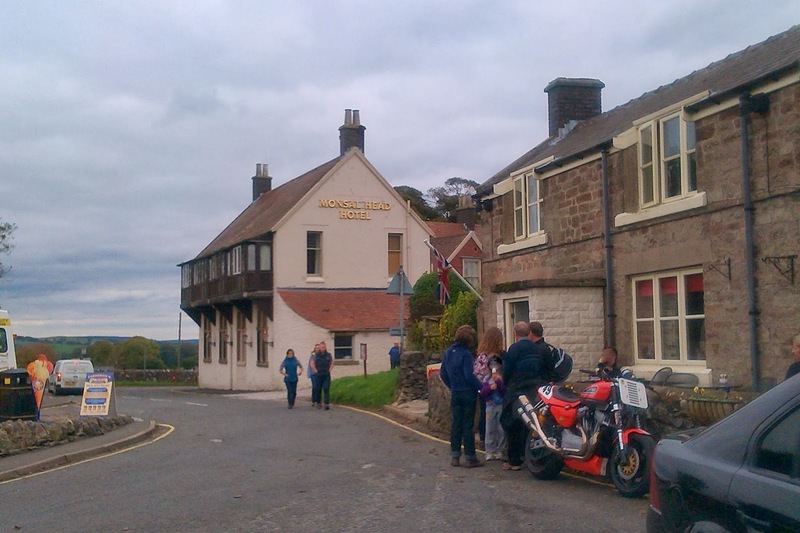 We stopped for a welcome drink and ice-cream at Hobb's cafe at Monsal Head - clearly a popular choice as the place was very busy. Luckily for us, they weren't so busy that they couldn't put our rucksack safely away when we forgot it and had to go back for it! 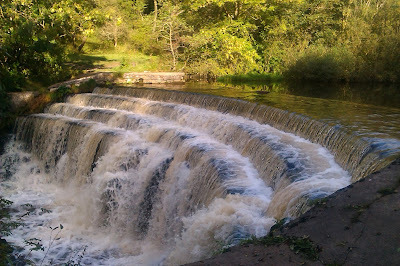 Our walk took us on to a weir where we had quite a job keeping both the dog and small daughter out of the water. It wasn't helped by the fact that small daughter's uncle was encouraging them both to leap in - although I noticed he wasn't offering to carry small daughter back to the car after she'd been fished out soaking wet! We moved on quickly before anyone got drenched and found ourselves on the last section of our walk. The scenery was beautiful and the sky much bluer than the photos show. In fact, it was perfect walking weather and we wished the weather could have been the same the following weekend when big daughter went back to Derbyshire to complete her Duke of Edinburgh expedition. Sadly, it threw it down all weekend and she was one very wet and tired daughter when we went to pick her up from the train station - but we were still very proud of her for completing her expedition! ... and later on whilst out with the dog the sun was still shining. Doesn't the sun look huge in this photo? I took it without really being able to see as the sun was in my eyes, but I think it looks amazing! On the whole, the dog and I have spent the week being rather wet when we've been out on our walks. It didn't stop me collecting these, though. 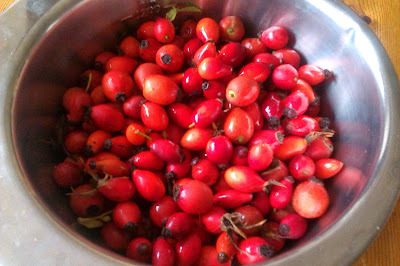 These little treasures are rosehips and I've been wanting to make syrup with them ever since I found the recipe in my favourite drinks book. They contain more Vitamin C than citrus fruit and were regularly made into syrup during rationing, but obviously I'm not old enough to remember that! 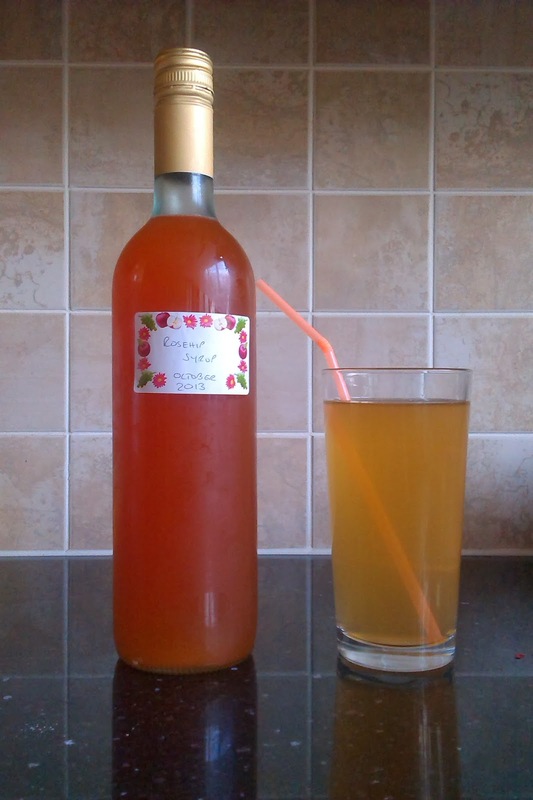 I do remember my Mum buying rosehip syrup to give to my brother when he was a baby, though, and I can remember trying it too and thinking it was wonderful. 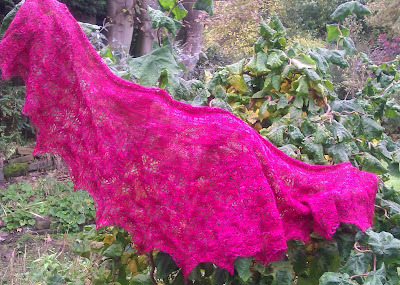 So, I decided to make the most of the hedgerow gift and make some for myself. And this is it! It doesn't taste quite the same as I remember it, but it's still rather nice all the same. I’ve been reading recently about the Law of Attraction. Simply put, the Law states that whatever you think about, you attract into your life at some point in the future. You act as a huge magnet that turns your thoughts into reality. There are books about it, films about it - you’d think everyone would know about it. And it certainly sounds simple enough, but no doubt it’s easier said than done. It made me think carefully about my life. Perhaps it has worked for me as I have the lovely home and family that I’ve always imagined and hoped for. I thought about other people that I know – and no doubt you know some too – who lurch from one disaster or illness to another, always complaining, always expecting the worst, and seemingly always getting it. It made me wonder whether there was something to this Law after all. If it is true that all we need to do to turn our thoughts to reality is focus very clearly on what we want rather than what we don’t want, then the real experts are children. If I was to ask small daughter to draw her ideal bedroom, for example, I would get the most beautifully detailed picture. Her focus is amazing and it works with teenagers too; big daughter knows exactly the sort of car she wants and the furniture for when she has her own house. A girl at my school dreamed of being a doctor and now that’s what she does for a living. So when do we stop believing that we can have our dream houses, our dream cars, our dream lives? Some people might say it’s when you start working and ‘living in the real world’, but that just implies that the real world isn’t a nice place which I’m sure isn’t right. So why are we more likely to focus on what’s wrong with our lives instead of what’s right with them? Whether you believe that the Law of Attraction works or not (and if it did, I’d have a yacht and four holidays a year, you might say), it must surely be a good thing to focus on positive rather than negative aspects of your life. It’s not easy, as for some reason it’s much easier to spiral downwards into despondency that remain cheerful when things aren’t going your way. I try to deal with unpleasant situations by thinking how much worse off someone else must be at that particular moment, and when you look at the newspapers, there’s always someone worse off than you. I think it’s time I followed my daughters’ lead and stopped being limited by the ‘real world’. I might not end up with a yacht or a mansion, but if imagining the world as a happier place with less poverty and sadness could potentially make it happen, then it’s certainly worth a go. I think so, anyway. 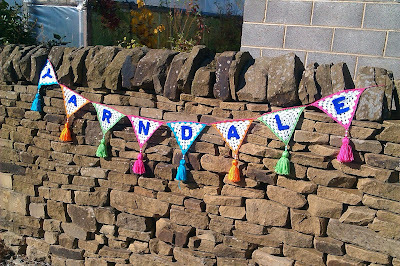 Yarndale - a feast for the senses! 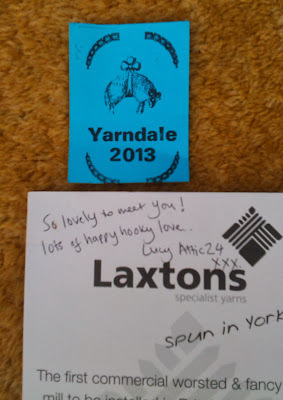 Like thousands of other people with more than a passing interest in all things woolly, I headed off to Yarndale this weekend. 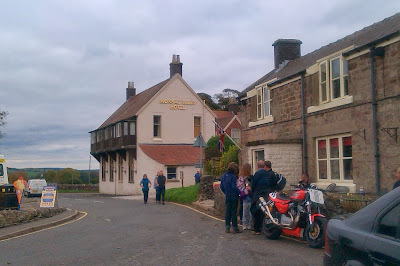 I went on Sunday which, it would appear, was the best day to go as by all accounts Saturday was extremely busy. The family decided that I would probably want to spend longer there than they would and they had other things they needed to do on Sunday, and so it was with a huge grin on my face that I drove through countryside that grew greener and more undulating the closer to Skipton I got. 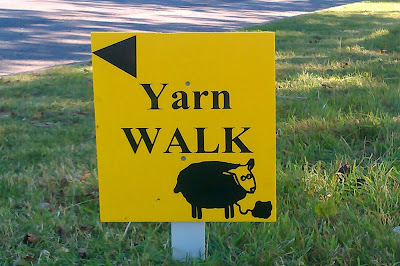 So - how to describe this wool festival that was different to any other that I'd been to? Well, through my senses, I think, which might help to give you an idea of what a lovely occasion it was. To start then - sight - and what a sight it was, to be greeted by bunting and yarnbombing right outside the Skipton Auction Mart door. And then, tickets and programme bought, it was into the entrance hall where there was more bunting than you can imagine hanging from the ceiling. Photographs don't really do it justice; it was more colourful than a picture ever is and for me, summed up people's desire to be a part of something special like Yarndale. 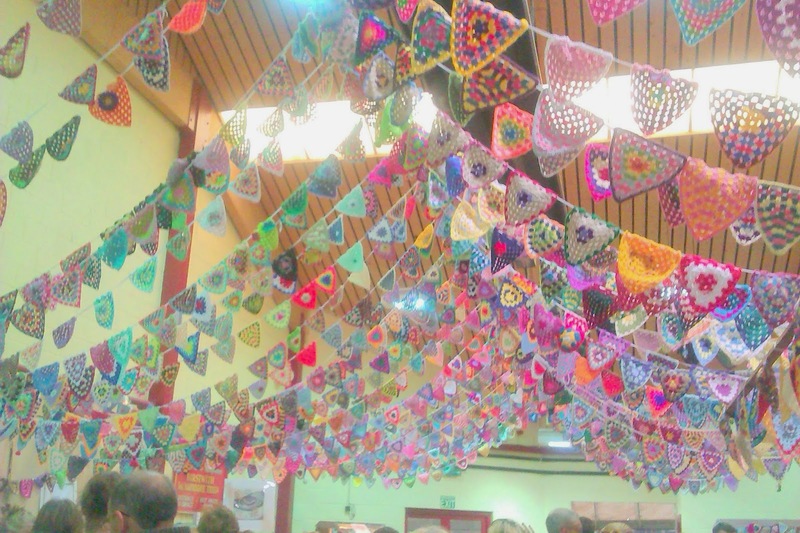 Crocheters from all over the world sent in over 6,000 triangles which, when strung together, made 1.25km worth of bunting. 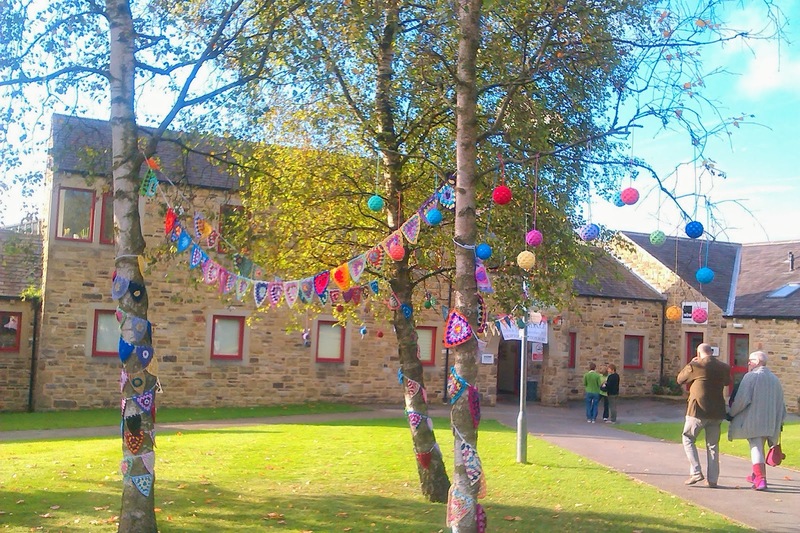 That's an awful lot of bunting! It also made me realise that trying to spot my triangles in all of that was a bit of a pointless exercise! 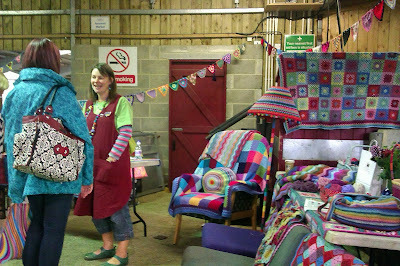 Beyond the bunting-bedecked hall were the pens, full of stall holders and their woolly wares - over 150 of them! I liked the idea that the sheep end-products were displayed in the same place that the sheep themselves are paraded on other days. As it had been a long drive from Winwick, I'd been sure to arrive early to get a parking space and consequently was one of the first through the doors - it was like being in a huge sweet shop - where to start? 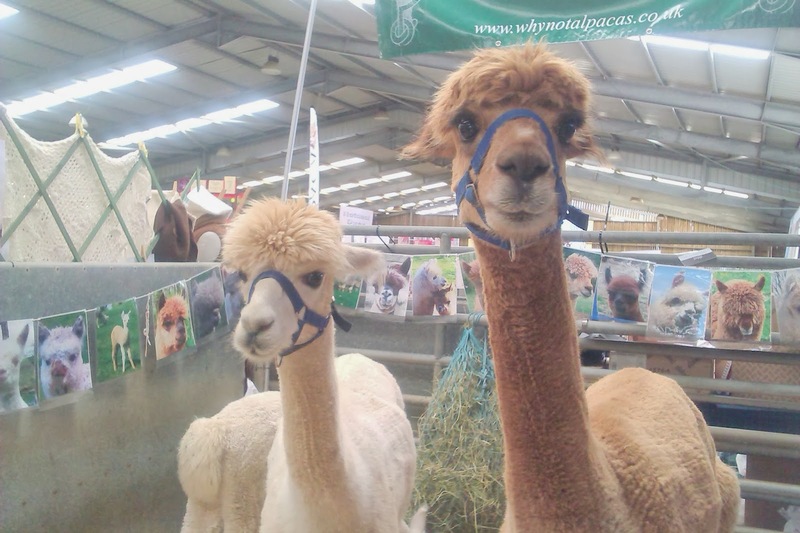 Stall after stall of beautiful hand-dyed yarns, shawls, knitted garments, needles, buttons, anything you could possibly think of, including alpacas! Such sweet-looking creatures, they were humming in a way that reminded me of my dog in the back of the car when he thinks he's going for a walk. The alpacas should definitely come under the touch category as their fleece is so soft and squishable! 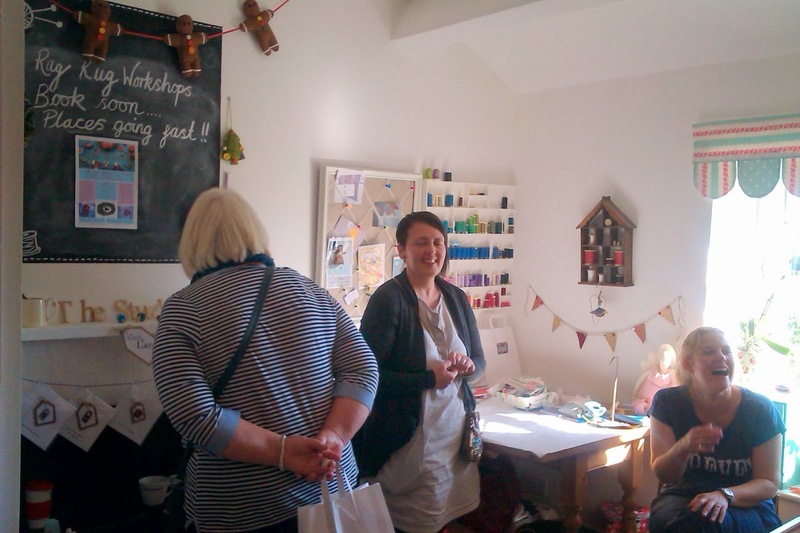 After a quick look around and a mental note of where I wanted to spend money later, it was time to head off to the workshop I had booked - learning how to dye yarn with Jaki Bogg. I've wanted to dye my own sock yarn for quite some time but have never been quite brave enough to launch in (not least because I know I'll probably make a huge mess!). This seemed like the ideal opportunity and after a couple of hours of soaking and dyeing various fibres, I think I'm confident enough to have a go on my own now. After that, it was time for some lunch and my sense of smell led me over to the smaller of the two cafes where I was tempted by a local pork and apple burger which tasted extremely good, I can tell you! And on the subject of smell, being so early into the auction mart, I noticed that it smelled of animals which added to the feeling of Yarndale being in exactly the right place. I took my lunch to the Knit n Natter lounge and there she was, surrounded by her fabulous crocheted creations - Lucy from Attic24. She's a lovely lady and a very unassuming celebrity; I think she was quite stunned by the number of people who wanted to come and talk to her as well as the huge crowds that had flocked (J) to Yarndale. People were queuing up to ask technique questions, tell her how much they enjoyed her blog or just to say hello, and she took the time to speak to all of them. I think it's quite amazing how someone's words on the internet can reach out to so many people and encourage or inspire them to creativity of their own. 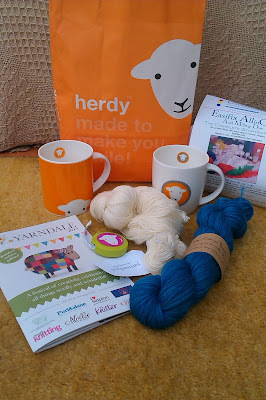 Not one but two new Herdy mugs to replace my broken one (they were a baargain, I couldn't resist - plus I've got a spare J), a new tape measure (another Herdy treat), some beautiful damselfly blue yarn from Eden Cottage Yarns and, thanks to Victoria at Eden Cottage Yarns pointing me in the right direction, some undyed sock yarn from Yarnundyed and a dye starter kit from Colour Craft to get started on my own dyeing adventures. Oh, and my Yarndale programme's there too. and this is Lucy's corner. 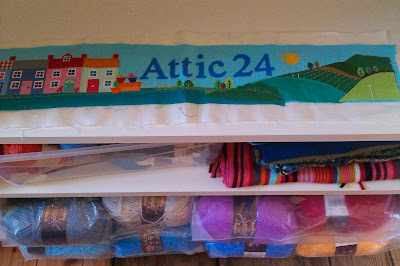 I love the Attic24 picture that is featured on her blog - here it is in real life! 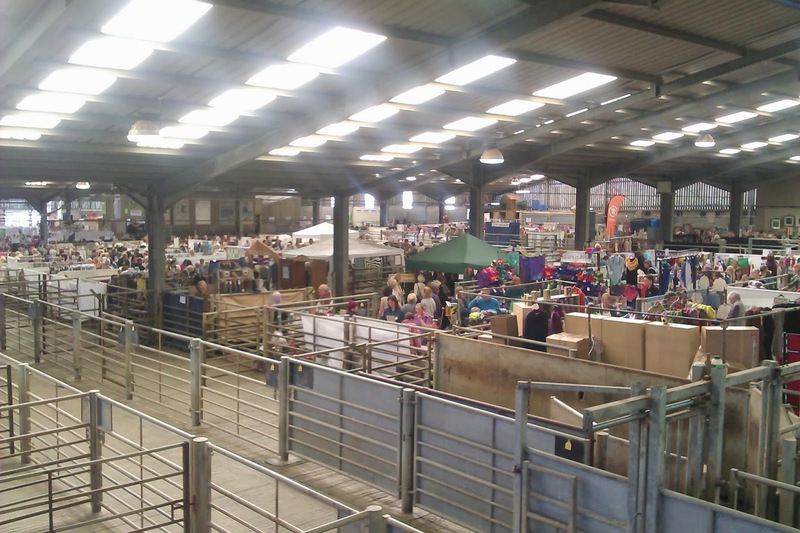 I didn't stay too long - The Studio isn't big enough for all of the people who wanted to come up to be in all at the same time, so I said goodbye and headed back up to the Auction Mart. It was still busy but I'd seen all I'd wanted to see and it was time to head home. I took a last look around from an aerial viewpoint - this gives you a little bit of a sense of just how big it all was - and then set off for the motorway and Winwick. 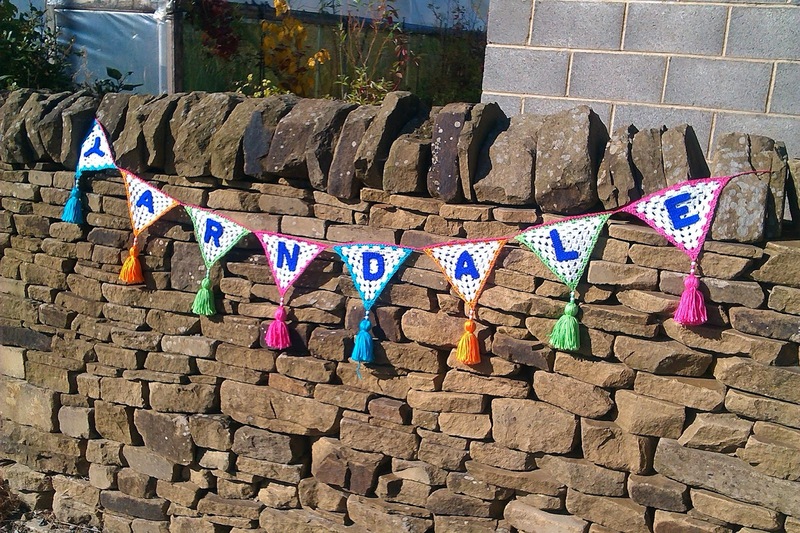 From talking to people on the day, I think Yarndale has been a bigger success than anyone imagined, and the good news is that will probably mean a repeat performance in the future. I'll be making quite sure I have my ticket.